Ben's Big Blog: By The Numbers: Which Rapper Mentions Themselves The Most? Which rapper do you think explicitly references themselves the most? I decided to analyse the discographies of the top-tier artists from Kendrick's generation to see just who is the most prolific self-promoter. And the result? 11.5% of Nicki's album raps are explicit references to herself. Here is a link to the sister article, the hard stats of each artist in the data-set. Analyse every track on an album's standard version. No deluxe editions (gets too messy and confusing with remixes and what not) and no mixtapes or guest spots (I'd be analysing the rest of my life). No collaborative albums either, because they skew the figures. Only explicit references, not descriptions ("The man", "The boss"), not allusions, and anything ambiguous I didn't include. When a rapper tells a story from another persons perspective ("Meet The Parents" by Jay-Z, "Immortal by J. Cole), the references aren't included. I also distinguished between ownership and description with regards to my. "My city", "my mom", "my crew" are not included, but "my bars", "my flow", "my career" are. I chose artists that were in the same era or "school"
But What About Kanye? Or Jay-Z? The Throne is notorious for self-references. Yet Kanye ranked 7th on this list, and Jay-Z 9th. Ahead of them were Nicki, Cudi, Big Sean, Future, Drake, and J. Cole. 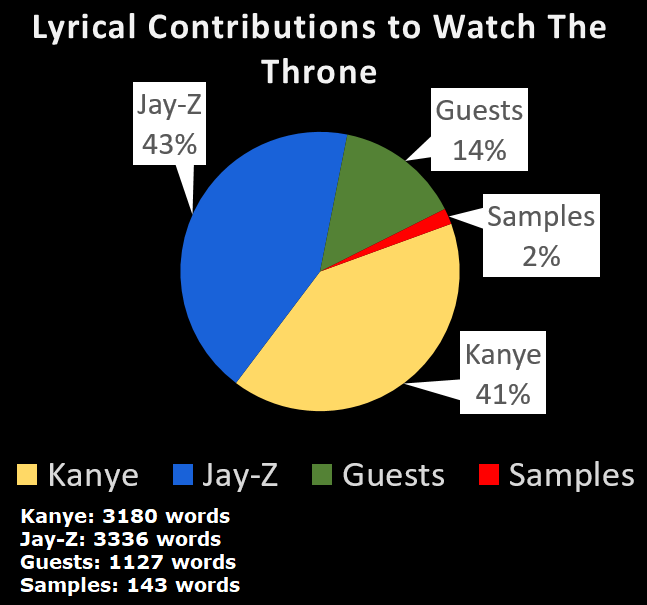 I haven't included Watch The Throne in the analysis because collab albums skew the data (word counts and mentions per-song). I did analyse it separately. Kanye: self-reference every 12.4 words. Jay-Z self reference every 11.6 words. Jay likely has the most nicknames and monikers in hip-hop history. As a result, and not unexpectedly, he is the most prolific third person self-referencer (10.49% of all his self-references are third person), but A$AP Rocky is a close second (9.96%). Kendrick refers to himself in the third person the least, with a mere 0.09% of his lyrics, or a third person reference every 1117 words, compared with Jay-Z's 119 words and Rocky's 120 words. Kanye, despite tracks like "I Love Kanye" (which featured a third person reference every 5.4 words, or 18.4% of the song), places third, but quite a long way behind Rocky and Jay. Which Rapper References Themselves The Least? Chance The Rapper is the least prolific self-promoter in this data set. He mentions himself every 15.3 words, or 6.5% of his rhymes. Kendrick is next, at every 12.88 words or 8.05%, and Jay-Z is third least, amazingly, with just 8% of his lyrics self-references. Nicki Minaj's Pink Friday has the highest proportion of self-references. Nicki references herself explicitly on 12.7% of the record, or once every 7.9 words. Kendrick's Section.80 has the lowest proportion of self-references at just 6.3%, or once every 16 words. The Life of Pablo was Kanye's highest placing album at 12th (10.1%). Yeezus came 31st, with 8.73%. Late Registration was 47th, at 7.50%. There were only 8 albums below it. American Gangster was Jay-Z's highest placing album, way down at 19th place. And The Blueprint 2 ran third last! Just 6.7% of Jay's only double album was devoted to self-referencing. Amazingly, 4:44, largely heralded as his most personal record, came 49th, with 7.4%. Nicki Minaj's "Right By My Side" takes the top spot. She raps 437 words on that track for 126 self-references, a staggering 28.8%, or every 3.4 words. "I" accounts for 107 mentions alone. Kanye's "I Love Kanye" is mighty close, but it's a skit. He mentions himself 39 times in 136 words, 25 of those in the third person. There are only two tracks in the entire data set that have no self-references from the primary artist. "We Aite (Wake Your Mind Up)" by Kid Cudi, and "The R.O.C." by Jay-Z, although the latter track Jay only performs the hook. There are 31 tracks in which the primary artist has no lines. These are mostly skits and guest performances (think "4422" on More Life or "Holla" on The Dynasty). "Last Call" has the most words by the primary artist of the entire data set, thanks to Kanye's huge spoken word outro. It's 2562. There are 4 others over 1000 words: "Note To Self" (Cole), "Sing About Me" (Kendrick), "Mortal Man" (Kendrick), "4 Your Eyez Only" (Cole).